This book started with a chill, and had me squirming and questioning everything at first. But then it got really slow. Then it got weird. Then I didn't really care anymore. It wasn't bad, but in the end, I just didn't love it. If I can give you one piece of advice, it is this: DO NOT find out what this book is about until you read it. The beginning of Servants of the Storm was so creepy and mysterious. I spent the first half of the book wondering what in the world was happening, and that added so much mystery and really compelled me to keep turning the pages. I just had to know! Dovey's quest to find out what happened to her best friend was intriguing, as were all the weird things that were happening in her town after Hurricane Josephine struck. I didn't know if there was some paranormal element, or if Dovey was just insane and needed to go back on her medication. It was just all so cryptic! There are so many things that this book had that seem like a perfect fit for me. I honestly normally like weird books, and this one definitely had an element of weird going on. It was dark and a little gruesome (pinkies bitten off left and right), and had the spooky element down, but something was missing for me. About halfway through is where it took a nose-dive. So much so that I almost didn't finish reading it. I really had to push myself through, and I can't say that in the end I was glad about it. It just got really boring for me, I'm sad to say. Once the mystery of what was happening in the town was solved, I just didn't really care anymore. Dovey wasn't a character that clicked with me. I didn't enjoy the love triangle. Isaac was pretty swoony, but even he wasn't enough to keep me interested. In the end, this book was decent, but it isn't a book I'll be pushing on people. If you're curious, and want to find out what it's all about, then you may end up liking it. Just don't read any spoilers!! Okay, so I have an ARC of this sitting on my "review" shelf at home. I was planning on reading it...until I read a review about an hour ago by another blogger. She COMPLETELY spoiled the book with absolutely NO WARNING whatsoever. I was pissed! I mean, as bloggers, we write reviews to give potential readers an idea of whether they think they would like a book based on our opinion/technical critique of said book. Personally, I NEVER include any kind of spoilers in any of my reviews. Just not my style. I don't even read reviews that say *spoiler alert* or something to that effect if I haven't read the book yet. So, when I read this blogger's review and knew that I had just found out the major mystery of this book, I was really upset. Now, I have no interest to pick it up at all. Why would I when I just read a "review" that gave away the freaking ending! Sorry for ranting on your review(which I really enjoyed btw) I actually wish I had read your review first and never saw hers! Then I would have totally given this book a chance. I'm just baffled that a veteran blogger would spoil a book because she didn't like it...with no warning. I did leave a comment on her review expressing my feelings about the lack of a spoiler alert. I mean come on? Who does that? Has this ever happened to you? UGH! Yes, that has happened to me before and it's so infuriating! Sometimes people spoil things just by making some random comment they don't even realize is spoilerish, but to deliberately spoil a book that isn't even out yet is ridiculous! To be fair, with this book, I'm not sure if the publishers are trying to keep it a mystery or not. 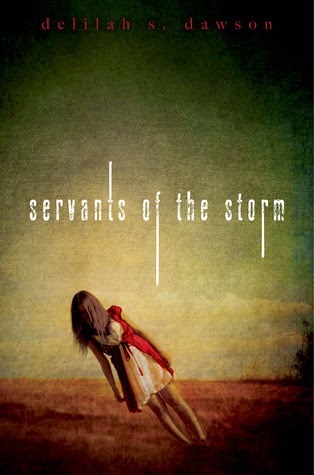 There's nothing in the blurb, and it definitely made me like the book 500x''s more NOT knowing, but after I found out what was going on, I happened to look at my "Servants of the Storm" bookmark and it's was written right there on the bookmark. SO, I guess they're kind of half-way telling? I don't know. I definitely think it should be kept a secret, and I was surprised when I saw that a few reviews just came right out and said it, which is why I mention that in my review, but I guess I can't really fault them when some of the advertising has it on it. Thanks for your comment! If you do decide to read it, I hope that didn't ruin it for you! You're welcome! I really wish I liked this one more!